Although some magicians claim to have supernatural or spiritual powers, all magicians are essentially showmen. No one understood this better than the greatest magician of all time, Harry Houdini. Stage magic is the art of appearing to do the impossible through the use of illusion or trickery. Part of the magician's code is to not give away the secret to the trick. 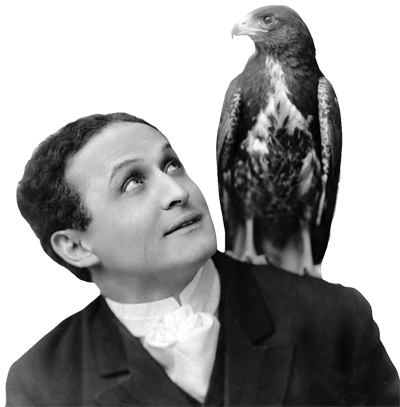 Still, Houdini spent a good deal of his career debunking the efforts of so-called spiritualists who claimed to be able to communicate with the great beyond. Houdini was born Erik Weisz in Budapest, 1874. His father, Rabbi Mayer Samuel Weisz, moved the family to Appleton, Wisconsin, in 1878. Erik was changed to Erich, and friends called him "Ehrie" or Harry. Eventually, the family settled in New York and young Harry made his show business debut as a trapeze performer at the age of nine. He became interested in magic after reading an autobiography by Jean Eugene Robert-Houdin, and adopted his hero's name (Harry would later write a book debunking Houdin's so-called powers). Initially, Harry began making the rounds of the Vaudeville circuits specializing in card tricks with somewhat limited success. He began experimenting with handcuffs and escape tricks and caught the eye of an agent who booked him into the Orpheum circuit and advised him to concentrate on escapes. 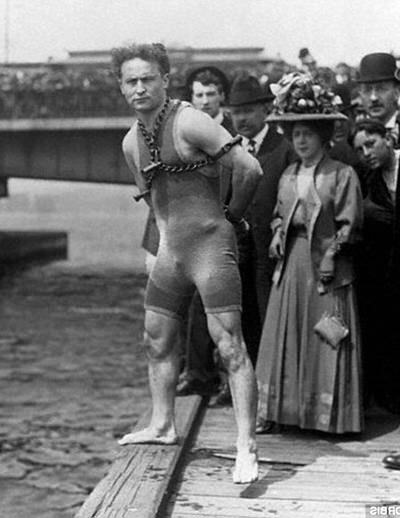 During Houdini's first tour of Europe he challenged the officers of Scotland Yard to restrain him in handcuffs. His continual ability to foil Scotland Yard's best restraints won him a six month booking at London's Alhambra Theatre. He continued to challenge police departments to confine him in their jails, handcuffs and straitjackets, but none of them could hold Harry. He even invited the public to devise restraints to escape, including being riveted into boilers, chained in mail sacks or nailed into shipping crates (often dropped into deep water). Many escapes would not have been possible without Harry's athletic training (he was a champion cross country runner in his youth), but he was not above 'tricks' like gaining "wiggle room" by flexing his arms or torso when being tied in ropes, or hiding a key or lock pick somewhere on his person. Some of Harry's most notable escapes included wiggling out of a straitjacket while suspended over the crowd by his feet, the "milk can escape" where he was handcuffed, shackled and placed in an oversized milk can filled with water and then padlocked shut, and the infamous "Chinese Water Torture Cell" escape. 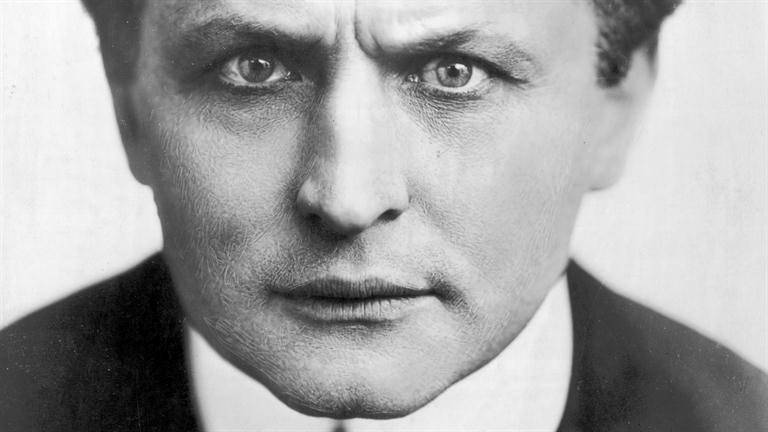 Houdini died before radio caught on commercially, but he did make a few Edison wax cylinder recordings in 1914, including an introduction to his Chinese Water Torture Cell escape, which is included in this collection. Although tricks and illusions were Houdini's stock in trade, he had a deep loathing of psychics, mediums and spiritualists. He was part of a committee from Scientific American which offered a $1000 prize to anyone who could prove their supernatural claims. Houdini was able to replicate their feats with his own illusions, and the prize was never claimed. One brand of spiritualist who particularly raised Harry's ire were those who claimed to communicate with the dead. Houdini and his wife promised to attempt to contact each other for ten years after one of them died. Harry died of peritonitis related to a burst appendix on October 31, 1926, (there is a story that the death was related to an unexpected blow to the abdomen from a fan, but the relation of the blunt force trauma and appendicitis has never been conclusively proven). 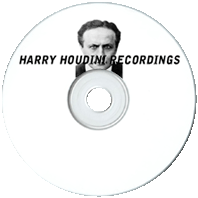 Bess Houdini held séances every year until 1936, this collection includes a 1936 broadcast of his last séance. Many other magicians carry on the annual Halloween tradition of a séance for Houdini, but Bess claimed that "ten years is long enough to wait for any man." See also: Magicians in Old Time Radio Collection and Dunninger the Mentalist. Be the first to comment on "Houdini Recordings"